Version 1.1 - November 16th 2008 - Bug fix release addressing all reported issues to date. The Emerald Dragon project has an over 5 year long storied history. When I started work on this project, it wasn't even mine. Back around May of 2002, D-boy was asking for help on the hacking of Emerald Dragon, specifically, the text compression. I started working on this for him during some off time I had from Dual Orb 2. That was supposed to be all I was going to do on the project. At the time, I had no intentions of doing anything else with Emerald Dragon. For reasons I don't have record of right now, at some point after that D-boy quit wanting to be involved in any of the hacking work on Emerald Dragon. Maybe I took too long, maybe it was his opinion of the SNES port, or just wanting to quit hacking. I don't recall at this point. In August 2002, Emerald Dragon was announced as an official project of TransCorp. I had figured out the compression and started coding a script dumper. D-boy was also at the helm as the translator for the project. 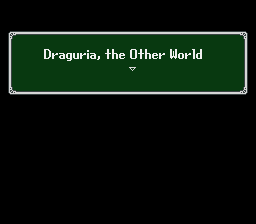 I believe it was D's Emerald Dragon page (which can still be viewed at http://emedra.lakuuna.org/) that got me interested enough in Emerald Dragon to pick it up as a project of my own. That and the fact that I had already invested a good amount of time in it. Progress remained steady on Emerald Dragon until February 2003. In February 2003, D-boy quit over what I believe was a single passing post on the message board to an inquiring fan where I mentioned merely the possibility of shortening or changing Saoshyant's name. 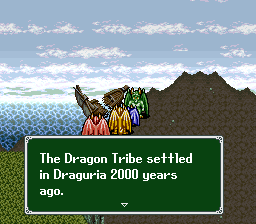 Without a translator, progress was slow on Emerald Dragon through most of 2003. A few technical difficulties came up with the text storage and trying to get a full dump along with obstacles in the menu work. Emerald Dragon was definitely a tough game to handle with many technical obstacles, seemingly having many remnants of the 8-bit computer architecture previous ports used. In many cases, it seemed artificial limits were imposed that were not necessary for the SNES. In February of 2004, some collaboration with David Shadoff whom was working on the PCE-CD port, sparked some new motivation to pull the project off the backburner. The PCE-CD version shared several technical similarities and exchanged some control code information. 2004 saw a lot of progress in Emerald Dragon hacking wise. The entire script was re-dumped, a new set of hacks were put in place for the menus to overcome space limitations, a 2-line item hack was completed and more. By December of 2004, a patch was released translating with most all of the non dialog work completed. However, there was still no translator for the main script. In 2005, a few translators attempted to pick up Emerald Dragon and disappeared, quit, or didn't have time. That seems to always happen on these projects. Sometime around April 2005, Eien Ni Hen signed up to translate the script. She retranslated all parts that were done already and got to work on the rest of the script. Thankfully, Eien proved to be much more reliable than past translators. 2006 was a rather dark year for Emerald Dragon as much of my time was spent bringing the Wozz project to a close. Eien finished the tentative final version of the script though in early 2006. Unfortunately, there wasn't enough man power to work on and complete both projects at the same time. In 2007, after being burnt out from Wozz, I took a good deal of time off from ROM hacking and was instead working on the ROMhacking.net site. It wasn't until July 2007, the 10th anniversary of TransCorp that I really got motivated again to finish Emerald Dragon up. In only a few months time, I reorganized and reworked all past hacking work on the project, coded an inserter for the game, inserted the entire script, and had the project ready for beta by the end of October. We've spent the rest of the time between then and now fixing the game and script up to be the best we know how for a public release. It's always a proud moment when a lengthy multi-year project gets finished, but I am truly proud of the Emerald Dragon Project itself. I'm happy with the script Eien put out in the end, and I am happy with the hacking work. I didn't have to make many compromises to my own ideals on it and got to do most of what I wanted to do. I really hope you'll enjoy several more years worth of my passion for and dedication to this hobby and community. 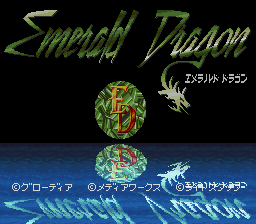 I freely and proudly give you the opportunity to play Emerald Dragon in English. Thank you to all who have given me words of support, all who have given a helping hand to the project, and the fans of TransCorp and our community. Take it, love it, cherish it! Eien Ni Hen: Eien proved to be a more reliable translator then any I have previously worked with. Communication was good, and she worked as diligently as could be expected on a hobby/volunteer based project. Those of us in our adult lives can really appreciate efforts like this knowing how difficult it can be. Thanks goes to Eien for being patient waiting for me to finish up the hacking long after she completed the script. I hope the experience was as good for her in return. **Beta Testers:**After having such a successful beta testing team for Wozz, I thought I'd try to reassemble most of the team and make some magic all over again. I would like to thank the beta testing team of Eien Ni Hen, Princess, King Mike, and Misty for finding and filing over 200 issues into the bug tracker! I'd also like to thank Trunkz0r and Liana for their partial testing assistance. Emerald Dragon was demanding on beta testers to find instances where text did not fit in the window as every text box in the game had it's own independent size stored separately from the dialog. While an automated in game approach was created, it could not cover all possible cases. 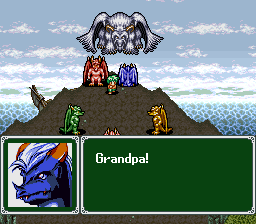 Emerald Dragon is a fun little refreshing game all around. On the surface it looks like your average 16-bit SNES RPG, and in some respect it is, but dig a little deeper and you'll discover the gold. The charm in this game is the character development. The games plot is driven by character development and interaction rather than the typical story telling fashion of most RPGs. There are 11 characters that will come in and out of your party throughout the game. Some will be more developed than others, but the core party members get well developed and you actually care what happens to them at the end of the game. This was a big selling point for me on this game. The main plot spins around a relationship and promise between a human named Tamryn, and a dragon named Atrushan. There's also a second primary relationship that develops throughout the game. 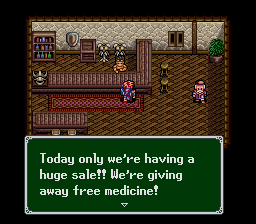 I won't spoil the plot much, but in addition to that, you've got the typical RPG fare of fighting the Demon Army, villagers with attitudes, ancient Dragon Gods, and treasures to be found. The game does not shy away from dealing with death, war, oppression and some other dark issues. 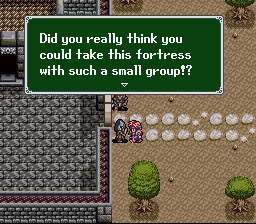 The battle system blends your typical turn based RPG with Ys series like ramming enemies! It's pretty simple, but adds a little bit of strategy with your stamina points for each turn and items and what not. 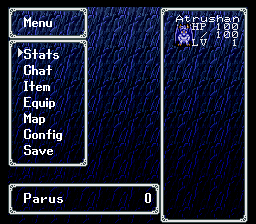 Only Atrushan is actually playable. Only controlling one character in battle turned out to be more fun than I thought. The computer AI was adequate and I didn't find myself yelling at them out loud often! 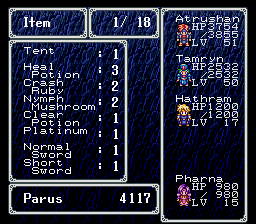 Atrushan and Tamryn are the only characters that level up, and it was interesting to see Tamryn progress her skills under AI control. The encounter rate is somewhat high, but the battles are typically fast paced and easy enough to be fun. 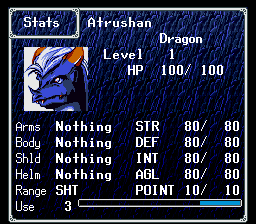 Emerald Dragon is an RPG that has spanned ports across several systems. It has been on the PC88/98, MSX, x68000, PCE-CDROM (Turbo Duo), FM-towns, and the SNES! There must have been something about this game to warrant so many ports. 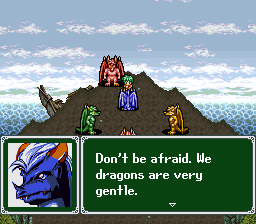 Those of you whom have read D's Emerald Dragon page will certainly have read his opinion on what he believes to be an inferior port. While some points are true, there are definitely some inaccuracies there (the musical changes off hand for one) as well as some arguably just and unjust attacks. I have also played the FM Towns version and the PCE-CD version myself and there are certainly things I prefer in the SNES port and things I prefer from the others. 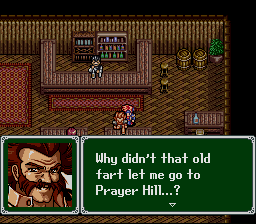 The SNES port certainly has it's pluses and minuses and contains many changes (as do the other ports), but it is currently the only version with an English translation at present time. I found it to be a fun game to play and I hope you will too. 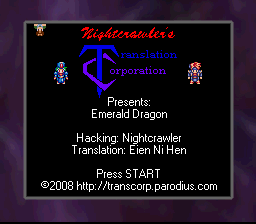 It's complete now, so you SHOULD find everything 100% translated! If you find any bugs, please report them at the TransCorp message board. Using the 'Remove' command from the 'Equip' menu may in some instances corrupt the 'Equip' menu title when exiting. Due to the dynamic nature of the game engine, I was unable to consistently reproduce the issue to fix it as each time you load the menu, things are loading in different RAM and VRAM locations. Honestly, I got too frustrated to fix it under those conditions. It should be unnecessary to use this command anyway as you don't need to manually remove equipment as equipping new equipment does this automatically. Gameplay should be unaffected. Special Thanks go out to these people for contribution and help in this project. Without you guys, this patch may not have been possible!